During the normal course of events, OpenIDM writes or updates various files on the file system to which it is installed. This includes log files, audit files, process IDs, configuration files, or even cached information. There are times, however when you find yourself needing to deploy OpenIDM to a read only file system – one to which you cannot write typical data. Fortunately, OpenIDM is flexible enough to allow such an installation, you just need to make some adjustments to various settings to accommodate this. The following information provides details on how to configure OpenIDM on a read only file system. It includes the types of information that OpenIDM writes by default, where it writes the information, and how you can alter the default behavior – and it does it in just 10 EASY Steps (and not all of them are even required!). Note: The following steps assume that you have a shared (mounted) folder at /idm, that you are using OpenIDM 4.0, it is running as the frock user, and that the frock user has write access to the /idm folder. 1. Create external folder structure for logging, auditing, and internal repository information. 2. Change ownership of the external folders to the “idm” user. Note: OpenIDM writes its audit data (recon, activity, access, etc.) to two locations by default: the filesystem and the repo. This is configured in the conf/audit.json file. As an alternate option you can disable the writing of audit data altogether by setting the enabled flag to false for the appropriate event handler(s). The following snippet from the audit.json demonstrates how to disable file-based auditing. Note: OpenIDM writes its logging data to the local filesystem by default. This is configured in the conf/logging.properties file. Note: OpenIDM caches its Felix files in the felix-cache folder beneath the local installation. This is configured in the conf/config.properties file. Note: During initial startup, OpenIDM generates a self-signed certificate and stores its security information in the keystore and truststore files as appropriate. This is not possible in a read-only file system, however. As such, you should generate a certificate ahead of time and make it part of your own deployment. 7. Update keystore and truststore files with certificate information and an updated password file as appropriate. The process you choose to follow will depend on whether you use a self-signed certificate or obtain one from a certificate authority. Note: On Linux systems, OpenIDM creates a process ID file (PID file) on startup and removes the file during shutdown. The location of the PID File is defined in both the start script (startup.sh) and the shutdown script (shutdown.sh). The default location of the process ID is $OPENIDM_HOME folder. 9. Repeat Step 7 with the shutdown.sh script. Note: OpenIDM reads configuration file changes from the file system by default. If your environment allows you to update these files during the deployment process of a new release, then no additional changes are necessary. However, if you truly have a read only file system (i.e. no changes even to configuration files) then you can disable the monitoring of these configuration files in the next step. Keep in mind, however, that this requires that all configuration changes must then be performed over REST. Property value substitution can be a useful technique for customizing OpenIDM deployments across multiple environments. Assume, for instance, that you have three environments (Development, Test, and Production). Your OpenIDM deployment has been configured for one OpenDJ system resource, but the configuration properties for that resource is different across each environment. The following diagram demonstrates the different host names for the OpenDJ instance in each environment. In order to accommodate this you would need to maintain three separate provisioner files – one for each environment you are operating in and you would need to manage each file separately under source control. An alternative, however, is to create OpenIDM variables that customize the OpenDJ configuration parameters based on the environment. The customizations are then centralized in a common file and selected based on settings contained in OpenIDM’s environment variables. Here are the steps necessary to configure OpenIDM property values. 4. Start the OpenIDM instance and look for any errors in the openidm0.log.0 log file. 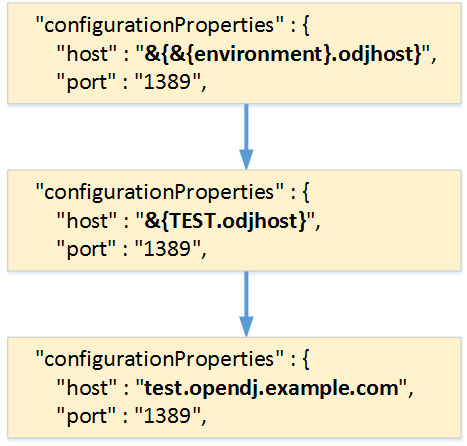 Assuming that everything started without any problems, you can now see that your environment specific parameters have been set correctly by querying the configuration object for OpenDJ, or simply by looking at the connector configuration in the OpenIDM Admin Console as follows. 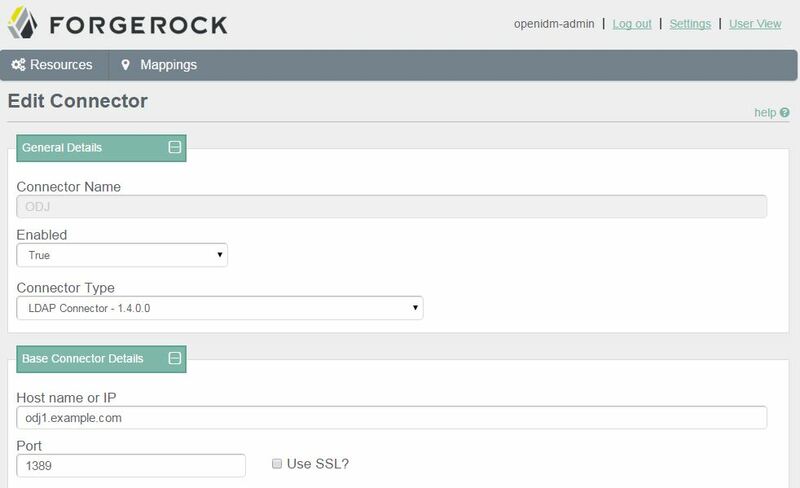 ForgeRock OpenIDM is a powerful account management and data synchronization tool that provides many robust features out of the box. Some of these features must be enabled, however, before they can be used. 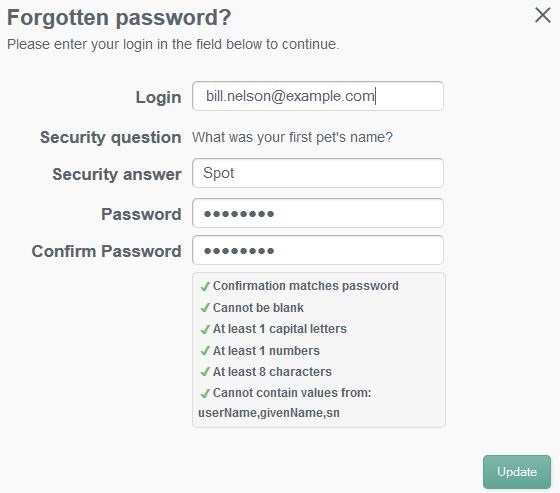 Once such feature allows a user to reset their password in the OpenIDM Web UI by responding to challenge questions. The OpenIDM Web UI provides an out of the box experience for resetting an OpenIDM user’s password based on a user’s response to challenge questions. This functionality is disabled by default and must be enabled in the ui-configuration.json file before attempting to perform this operation in the WebUI. The following instructions describe how to enable this functionality and test the password reset flow and have been tested with OpenIDM version 3.1.0. Note: Modifications to files in the conf folder are hot swappable; this means that your changes are now in effect without the need to restart OpenIDM. Assuming you have not made any errors in configuring either of these two files (you can confirm by looking for errors in the openidm/logs/openidm0.log.0 file), then you have now enabled password reset for the WebUI. Before this feature can be used, however, a user must first enter responses to challenge questions. 4. Go to OpenIDM user interface (http://openidm.example.com:8080/openidmui/index.html#login/). You will now see a “Reset your password” link available in the login form. 5. Log in as an existing user (i.e. bill.nelson@example.com). 6. Select the “Change Security Data” link. 7. Enter your current password in the form provided and select the “Continue” button. 8. Enter and confirm your password in the fields provided. 9. Select a security question and provide an answer in the space provided. 10. Select the “Update” button and then log out of the user interface. Note: You can now test the password reset functionality. 11. Return to OpenIDM user interface (http://openidm.example.com:8080/openidmui/index.html#login/). 12. Select the “Reset your password link”. 13. Enter your username (i.e. bill.nelson@example.com) and click the “Submit” button. 14. You should see the security question that you selected in step 9 appear. Provide the response that you entered in step 9 and click the “Submit” button. 15. 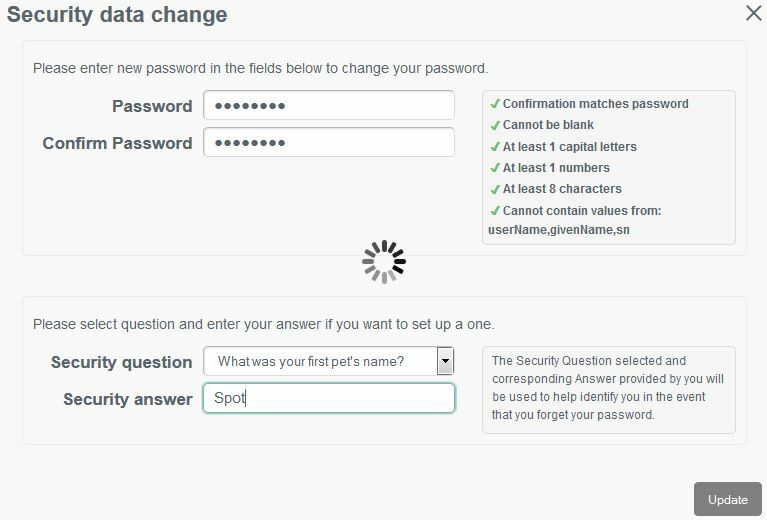 If you responded to your security question properly, then you will now see form elements appear allowing you to enter and confirm a new password. 16. When you click the “Update” button, the new password will be applied to your OpenIDM object and you will be automatically logged in to the end user interface.